Here are slavic bride and groom amigurumis - my recent creation for my lovely friend's wedding. 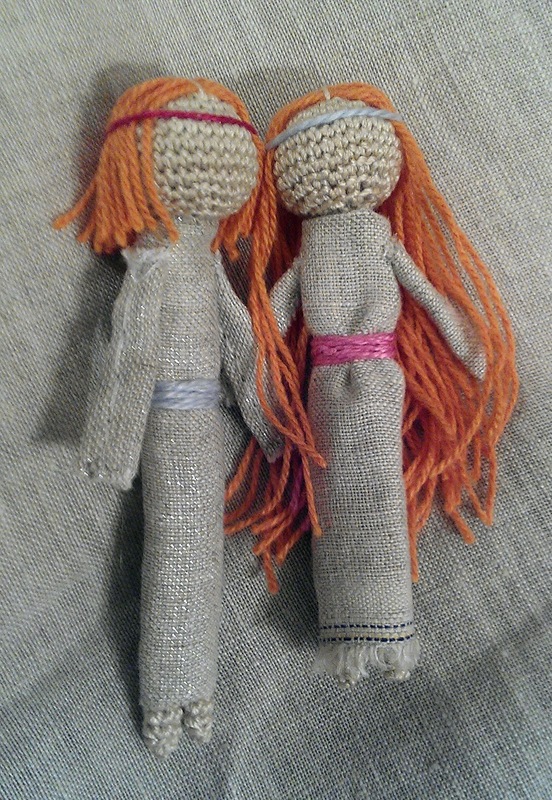 Both bride and groom have light brown hair with red tint, that's why I used orange yarn to reproduce their hair. Sorry for not the best quality photo, unfortunately I haven't enough time to wait for the proper light. We have constant rains here lately. The deadline for this present was really tight, so I had to significantly simplify the scheme. The initial idea was much more rich and detailed. But I think I've managed to keep the symbolism and put my soul, good energy and best wishes into it. Hope it will bring only luck and happiness to it's new owners. I used linen fabric to make their clothes, blue and pink yarn for belts and headbands, orange yarn for the hair and some synthetic filler to fill the heads. Amigurumis are about 10 centimeters high.